The first poster frame that MCS made over 30 years ago. 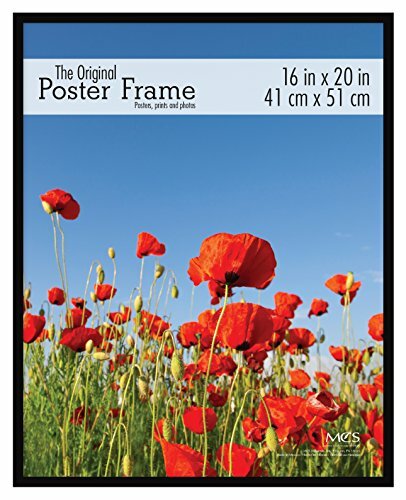 A top seller from the start -this poster frame has maintained its popularity through the years. The frame is backed with cardboard to add stability. What is Frustration Free Packaging? The packaging is tested and approved by Amazon Labs to meet several shipping standards including actual shipping tests and dropping tests. This insures your frames arrive in one piece and in the same condition they left the factory. 16x20 Inch black poster frame made to display fine art, posters, enlarged photos and more! Frame features hinged hanging hardware for vertical or horizontal wall display. Sturdy styrene front and packed in a custom fit box. If you have any questions about this product by MCS, contact us by completing and submitting the form below. If you are looking for a specif part number, please include it with your message. wall26 Rustic Home Decor Canvas Wall Art - Retro Style Purple Lavender Flowers on Vintage Wood Background Modern Living Room/Bedroom Decoration Stretched and Ready to Hang - 16" x 24"
By Vintage Book Art Co.